Love barbecues? 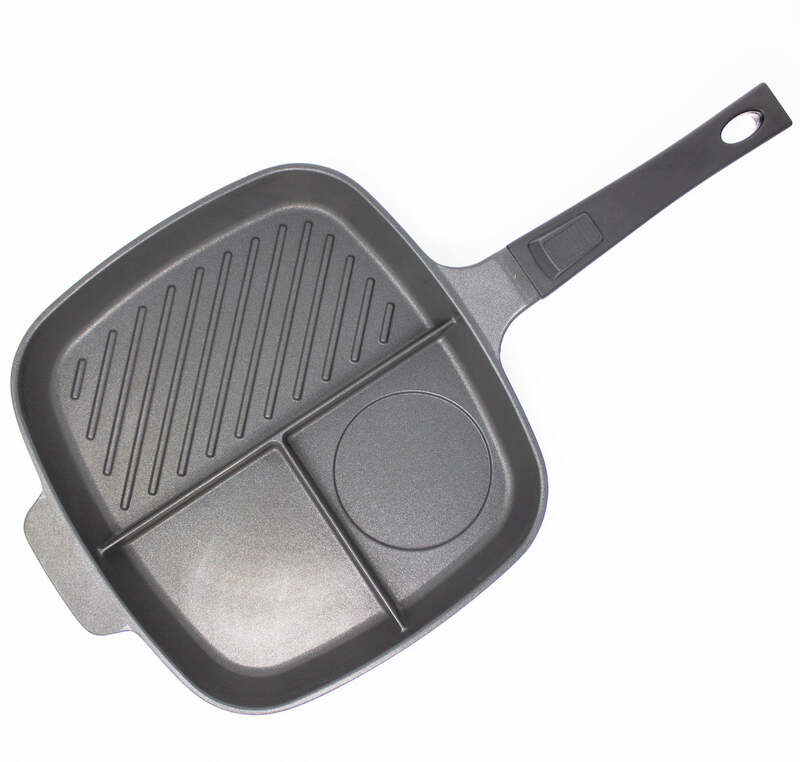 The Jean Patrique Cast Aluminium Non-Stick Griddle Plate lets you enjoy delicious BBQ-style meals right in your home. This large rectangular griddle plate, with a 42 x 27cm cooking surface, is made from high quality cast aluminium with a bonded steel base that heats up quickly and evenly so you get a consistent cooking surface. The non-stick surface helps you make healthier meals with little to no oil. 6 stainless steel skewers fit perfectly in assigned grooves for making healthy BBQ-style meat, fish or vegetable kebabs on the hob or in the oven. The Jean Patrique Griddle Plate works on any type of hob, including induction, ceramic, gas and electric. Equipped with a pouring notch to help drain excess juices. Suitable for temperatures up to 250°C. Perfect for when you want to sear on the hob and then add to the oven to marinade you meals. Size: 42 x 27 x 5.5cm, 2.2mm thick. 10 people have already found today's egg which brings us to the end of The Great Jean Patrique Easter Egg Hunt. Thank you so much for participating! CAST ALUMINIUM – Lighter than cast iron, but every bit as strong. With a non-toxic non-stick surface designed for excellent heat retention and distribution. 6 STAINLESS STEEL SKEWERS – The steel skewers can fit perfectly in assigned grooves to help you make healthy meat, fish or vegetable kebabs on the hob or in the oven. OVEN AND HOBS – Our griddle pan can be used on all types of hobs including induction, ceramic, gas and electric. Also works wonderfully in ovens all the way up to 250°C. DEEP GRIDDLE LINES AND POURING NOTCH – The specially designed deep griddle lines can help to reduce excess fats or oils released during cooking. Also equipped with a pouring notch to help you get rid of any excess juices. SUITABLE FOR HIGH TEMPERATURES – Our rockstar griddle handles temperatures as high as 250°C. It’s the perfect choice when you want to sizzle food in the oven. Comes with a pair of detachable heat resistant handles to help you use your griddle plate from hob to oven with ease. Sorry I cannot say I have not used it yet. Fire stars for quick delivery.